Sometimes we wonder what you luthiers make such a fuss about. 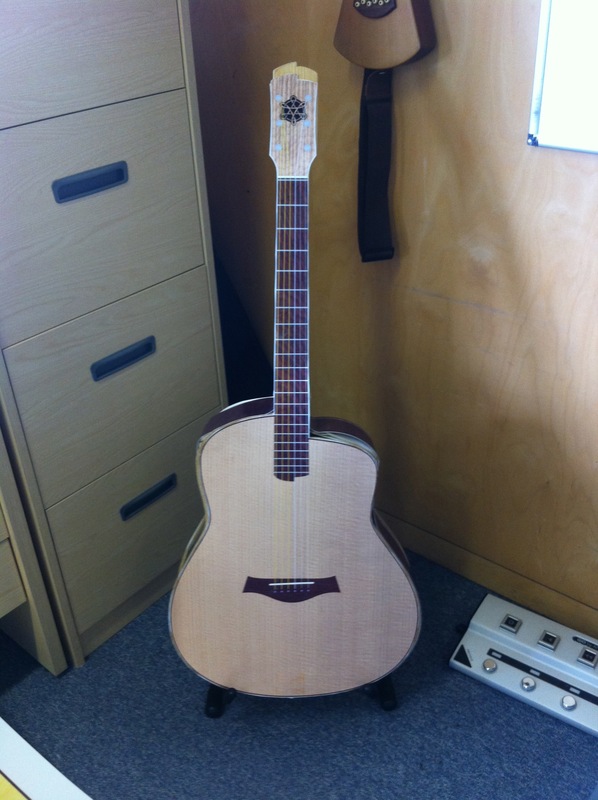 It only took Liming few days to build a prototype guitar. Admittedly it is made from paper, cardboard and some hefty planks of wood, weighs about as much as a small sideboard, has no strings, no soundholes and the glued on paper patterns are already beginning to peel off. So you couldn’t even begin to think about actually playing it. Apart from that, it’s not that bad! What our paper mock-up is good for, however, is helping us test how scannable our decorative patterns are likely to be. 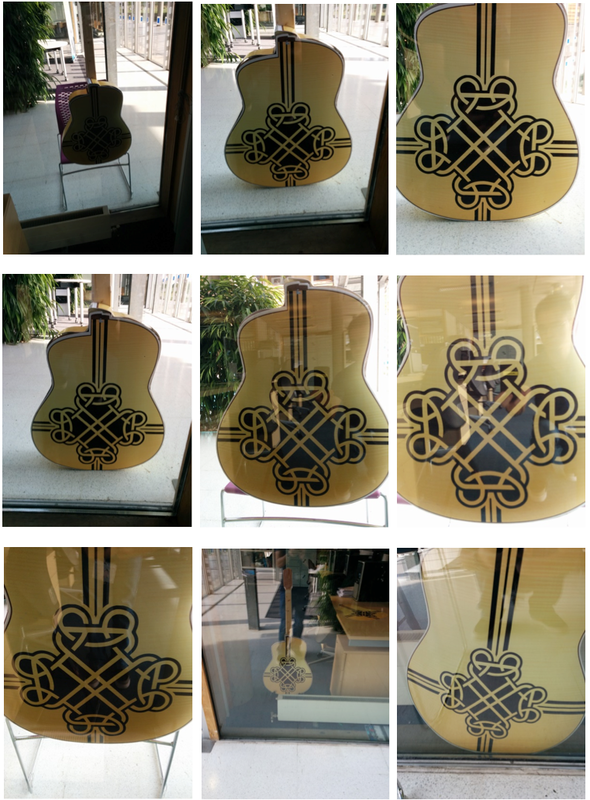 We are particularly bothered about the large decoration on the back of the guitar as we want people to be able to scan this from some distance away, perhaps through a shop window, display case, or even from the audience at a gig (if the guitar was deliberately displayed with its back to the audience before, after or during the interval). 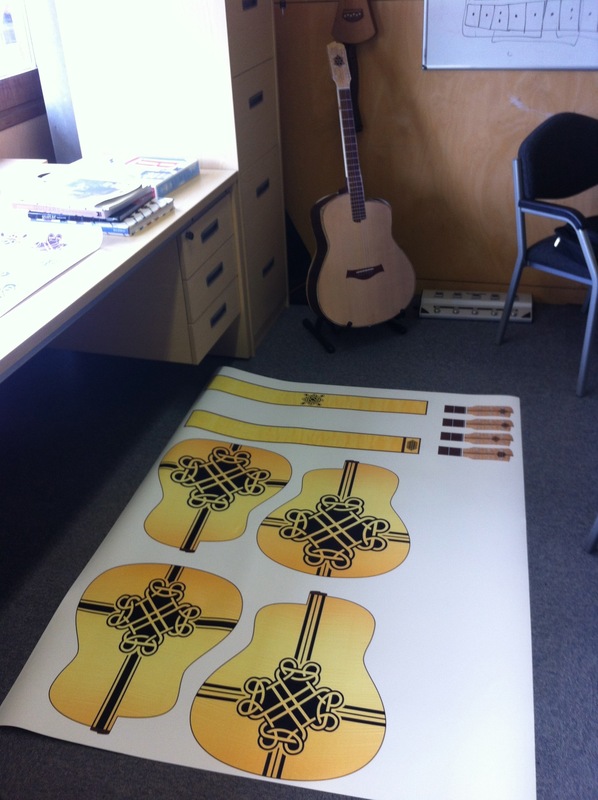 We adapt one of Liz’s celtic knotwork designs, print out some large sheets of paper and stick them onto the back of our mock-up so that Liming can carry out systematic testing. He tries scanning various sizes of pattern from various distances and viewing angles, under different lighting conditions and using several models of smart phone. The results suggest that our final design could be scannable up tp 5 metres distance, depending on phone and conditions. Scanning through a glass window also seems possible given appropriate lighting behind the guitar so as to reduce problems of reflections.